With a unique gripping compound that increases feel for added control, spandex fabric finger gussets and glove back molds to your hand, a supreme ventilation system that helps keep hands sweat-free and dry, and an elastic wrist wrap for increased support of tendons, this glove could be exactly what you need to help keep your hand secure while bowling. Great gripping glove to help me bowl. The size was perfect. Looks cool too! Hey Stu! This glove will increase the amount of grip on your ball, which should also help increase the amount of rotation that you're able to put on the ball as you turn your hand around the ball. Ball slips out of hand, not a good grip as hand is small and even though ball is light weight grip not secure. Does this glove grip bowl to avoid this problem? This is a perfect fix for this problem. The texture from palm of the glove will help to give you added grip on the ball for better control on your release. I am looking more for tight support for my hand than anything else. I start getting pain in the back of my hand without some tightening support from a glove. Don't want any stiff wrist support, or like type glove. Will this do what I want? Hello DrJ. This glove will have an elastic wrist wrap for increased support of tendons. 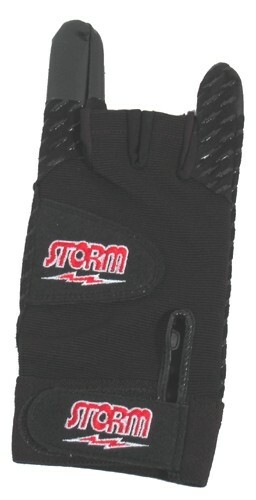 Due to the time it takes to produce the Storm Xtra Grip Glove Right Hand Black ball it will ship in immediately. We cannot ship this ball outside the United States.